Friday’s rowing fizzed with excitement as a hot sun shone on the Plovdiv Regatta Centre, a tame tail-wind failing to complicate proceedings. 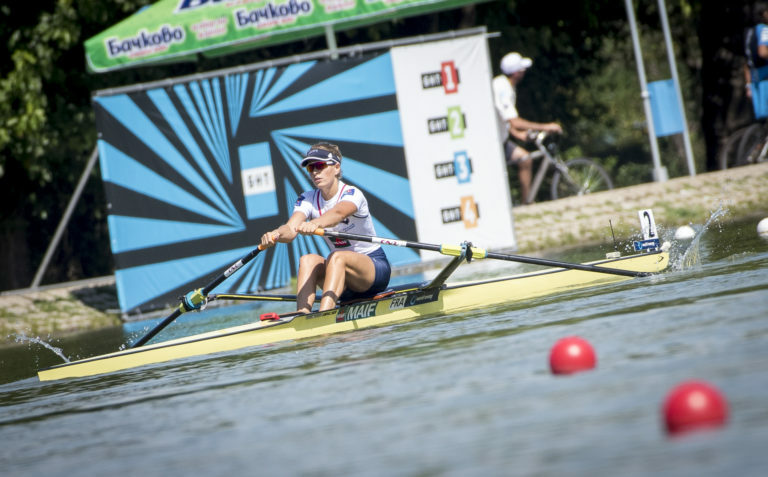 It was medal season at the lake, and with highlights including the first PR2 singles finals and some highly competitive lightweight sculling, plus the best lightweight quads final in about a decade, the first ten world champions of 2018 were crowned. Some medal races were of course easier than others, and with winning margins of over 10 seconds in the PR3 mixed doubles (for Brazil), PR3 men’s pair (Canada) and lightweight women’s pair (Italy) the afternoon could have become a bit tedious while the lightweight men’s pair was a three-horse procession even though the Italians sprinted to the line as they won. But the quads races were stunning, albeit in different ways. The LM4x around the time they reached the course bridge had become a wide-open contest. Germany were leading — and went on to win without ever really being in danger — but the rest were within a length of each other and bidding fair for a photofinish. It didn’t quite happen as they spread out in the final few hundred metres, but only the Czech Republic slowed down as they realised a medal was out of reach. The revelation was Turkey, pushing through Denmark and then having to fight to maintain third, the Danes never stopping the attack. Turkey hung on for it behind Germany and Italy for what I think is their second world championship medal, the first being a LM8+ bronze in Amsterdam from a five-boat final. In the lightweight women’s quads China made their new performance director (a certain Sir Steve R) sprint past the peloton on his bike to keep up with them, pulling out fast to a strong lead and then moving out further to what was eventually closer to two lengths for the gold. But the battle behind them was at first very close, and at around 400m gone it was tricky to tell who would surge into the medals. Eventually after a pretty slow start Denmark made the big push for glory, which got them past demoralised Italy and a slightly fading Germany. Germany found one final burst of speed at the end to hold off the USA but for a while it looked touch and go. Seventeen countries featuring on the medal table already, and from all continents except Africa, is a pretty good diversity return on FISA’s investment after the first tranche of finals. The para-rowing, international-event and Olympic-event circles don’t completely overlap on the rowing Venn diagram, so this pattern is to be expected early on. 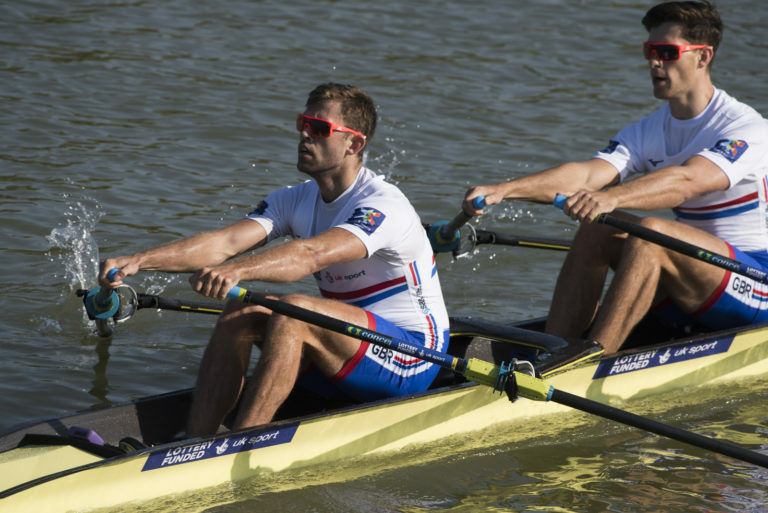 The PR2 singles are a new refuge at world championships level for those in the Mx2x class whose rowing partners have retired, can’t compete this year or simply don’t yet exist. 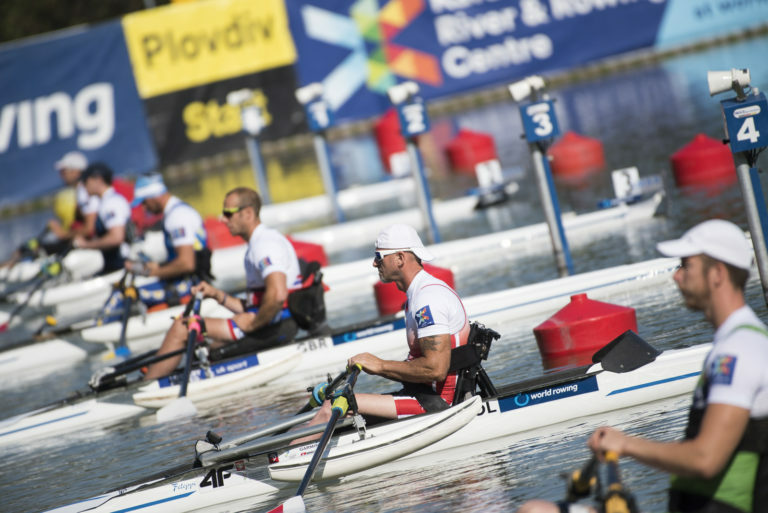 Long overdue, the insertion of these extra para-classes, which will need nurturing, is a welcome way to support the general para-rowing community. The women’s gold went to an absolutely delighted Perle Bouge (former Mx2x champion), her runner-up Annika Van der Meer (NED) saying that her medal was a silver tinged with gold. The men’s title was never going anywhere other than to Dutchman Corne de Koning, who now owns the world best time, world champs best time (for what that’s worth) and the inaugural world title: Bouge matches him on all three. Interestingly the difference in WBTs for the two PR2 singles is almost exactly the same as that for the two openweight singles, despite being a much longer race. 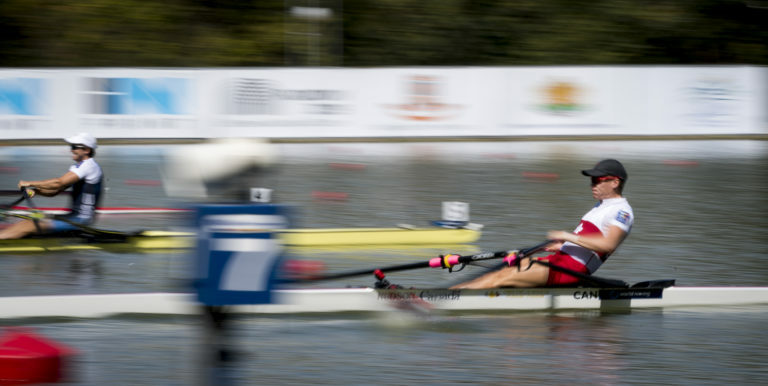 Photo Laura Tarentola (FRA) winning her LW1x final. The lightweight singles rounded off the medal section with a first ever gold for an utterly delighted Laura Tarentola (FRA) who had come second at the Europeans and clearly viewed the worlds as a big step up. She was slower off the start than Britain’s Imogen Grant, but made her power and experience count in the second quarter and then managed to deny Italian Clara Guerra, who raced through like a streak of lightning in the final section to claim silver only 0.17sec behind Tarentola and despite Grant’s best sprint. The casualty of the day was Belarussian semi-final winner Alena Furman, who suddenly stopped racing, possibly to ease a cramp or similar, and then paddled in minutes behind the rest. The men’s title was never really in doubt, and went to the exceptional Jason Osborne who seemed pretty chilled at the result after leading from first to last. Behind him was the real race, at first a three-way scrap between Aaron Lattimer (CAN), Michael Schmid (SUI) and Andy Campbell Jr (USA) but it was Schmid who outwitted his two rivals with a fantastic second half which pretty much wrapped Campbell up while Lattimer also faded. We’ve started with the finals since that seems only fair, but in truth the other racing was fantastic, particularly the eights races which started the day. Both were last-ditch sole reps and the W8+, unusually beginning the programme, ended with only China out the back, the other five crews bashing each other constantly to try and get the four qualifying places. The Dutch and Romanians were half a second apart and will bag the lanes next to the US and the Aussies in the last race of the regatta on Sunday. Canada, who had initially led until succumbing to the forceful Dutch charge, managed to regain their cohesion in the last quarter and clung on behind Roumania, while Britain, who had faltered to fourth in the middle, managed to hold it despite several very big New Zealand pushes. The men’s eights was a vicious qualification, only two out of five getting to the final. And when those five include the countries who have Olympic gold, European gold and world cup gold in their recent pedigree and all felt they under-performed in the heats, nobody’s going to give up. In truth Canada (newly back onto the men’s eights scene) and New Zealand never really got a sniff, but after Britain charged out like madmen and got nearly a length on Roumania and the Netherlands, the fist-fight between the latter two was always going to close the Brits down. They kept the upper hand enough to win, and after running for several hundred metres with nothing to choose between them, Roumania managed to get a few seats advantage sending the Dutch to the misery of the B-final. For Britain, which has a highly ambitious target of 4-6 Olympic-class medals here (plus 1-2 Paralympic medals), it was a useful confirmation that the top men’s sweep boat can still do their stuff, but it will take more than that to win a medal on Sunday with all three of Germany, Australia and the US clearly on fine form. UK Sport’s funding for GB Rowing could be reduced if the British team misses its target, and they only have eight crews in Olympic-class finals from which to meet that goal. Photo Angus Groom and Jack Beaumont (GBR M2x). The doubles were fun, a five-boat contest in the first M2x semi and a more relaxed yet still contested three-way battle in the second. Frenchmen Matthew Androdias and Hugo Boucheron are definitely the ones to watch, with Brits Angus Groom and Jack Beaumont looking a little more stretched but nevertheless not showing their entire hand yet. Defending champion Kiwis John Storey and Christopher Harris, whose wives are both expecting babies within a week of each other next January, I’m told, seemed to be a bit more under pressure. The women’s doubles were equally interesting with another reigning world champion Kiwi crew being narrowly beaten, this time Olivia Loe and Brooke Donoghue by the ever-green US duo Ellen Tomek and Meghan O’Leary. Meanwhile Canada’s Gabrielle Smith and Andrea Proske pulled a blinder in the other semi, gaining then losing then gaining the lead in a four-way bash with some very feisty Lithuanians, Poles and Brits. The Brits are the under-23 champions and at one stage looked as if the big league was going to overwhelm them but they rallied as early leaders the Czech Republic inexplicably faded and managed to defeat Poland to grab third to reach their first senior worlds final. 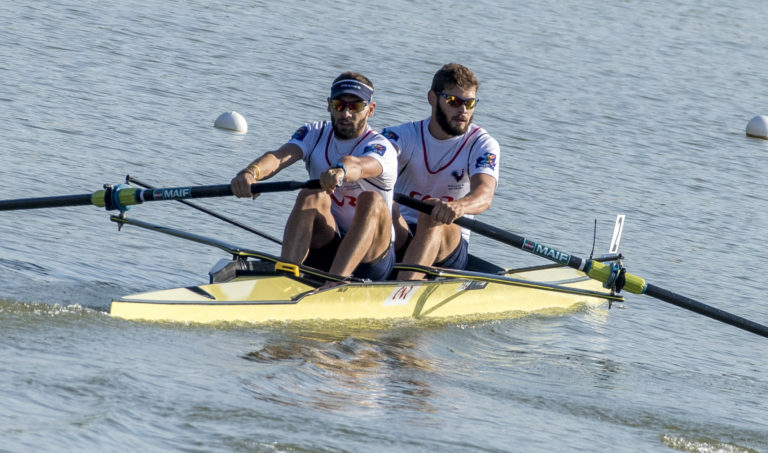 There is a real chance that the men’s pairs final on Saturday will be a beep-to-line close race after the six countries who qualified did so with virtually identical times in the two races. Serbia and Britain were the two nearest misses, but ROU/ESP/NZL and CRO/FRA/CAN were all within a 2-second range. Croatia perhaps had the most in hand, but all the Roumanian crews have been improving steadily during the regatta and we know how dangerous the Onfroy brothers can be. A welcome change from the mile-long victories of the Kiwi pair days (and Redgrave/Pinsent before them), if I’m honest. Much more fun for disinterested observers when you don’t know who will win. Photo Onfroy brothers (FRA M2-). The same can’t be said of the men’s PR1 singles, once again heading for a Erik Horrie win. Don’t be fooled by the fact that Ukrainian Polianskyi’s SF1 winning time was much quicker: Horrie was paddling at a crawl near the end of his semi-final and looks likely to boss the water again on Sunday. The women’s openweight singles may also be quite a stretched-out final, winners Jeannine Gmelin (SUI) and Sanita Puspure (IRL) not really being pushed by the USA and Denmark behind them. Austria trumped Australia in the second semi as Magdalena Lobnig snatched the last qualification place from Maddy Edmunds, but that was the closest it got. However, the key to Sunday may be Puspure, who is looking stronger than ever. If anyone can get Gmelin and break her undefeated singles record it’s Puspure, but she will need to be right on the top of her game to do it as the Swiss sculler has weapons she has not yet had to unleash here. 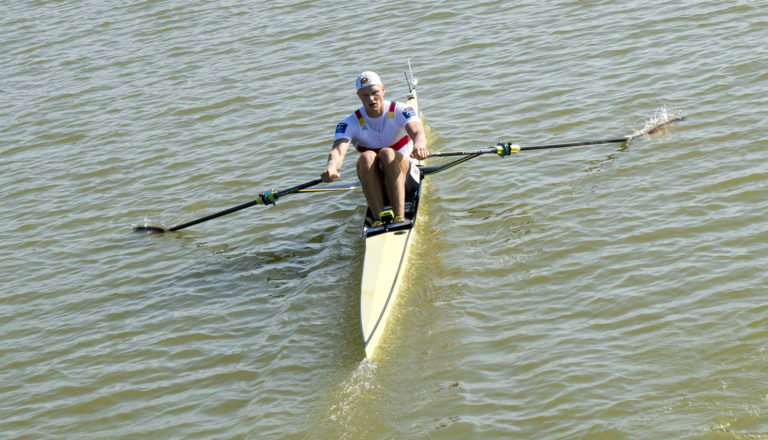 Photo Oliver Zeidler (GER M1x). Fortunately we can rely on the openweight men’s singles not to let a racing session become at all routine, and whlie Ondrej Synek (CZE) and Oliver Zeidler (GER) played who-can-go-slowest-in-the-last-200-but-still-qualify, the other semi-final was won by European champion Kjetil Borch (NOR) ahead of a duelling quartet which included the world’s fastest single sculler, Robbie Manson. The Kiwi seemed to get a little flustered when the indefatigable Harry Leask (GBR) came bouncing along at the end, and despite rallying to find a new gear to his sprint, Manson lost second place to the Brit on the nod by 0.17 seconds, and was fortunate that Dane Sverri Nilsen wasn’t closer to mount a real challenge. Don’t be fooled by Synek’s time — he, Zeidler and Lithuanian Mindaugas Griskonis were virtually paddling the last few strokes and the final could well be very tight indeed. 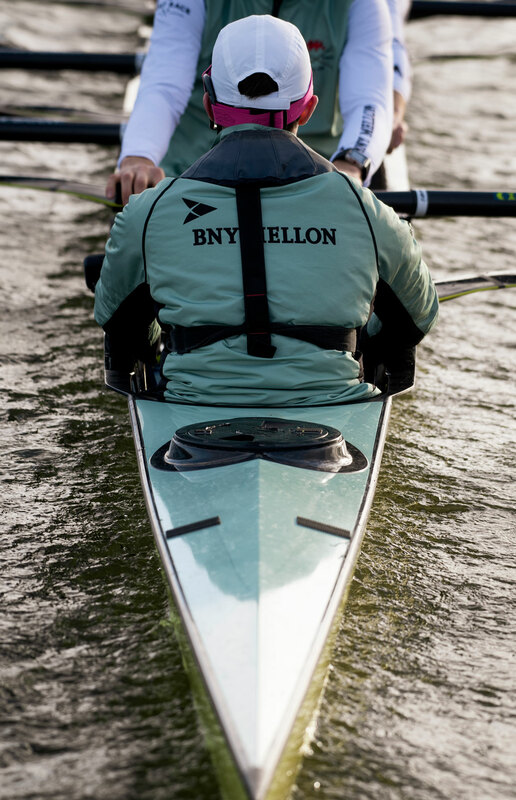 Racing kicks off again at 9:30am with B-finals on Saturday, and then we’re into another juicy medal run with lightweight doubles, pairs, fours and quads on the menu. Delicious.